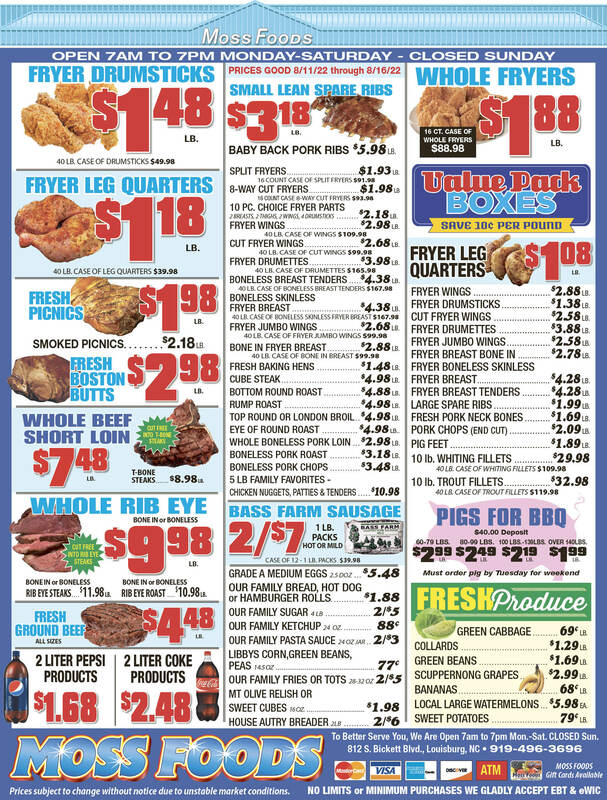 Showing 33 articles from March 9, 2016. DIVERTER. 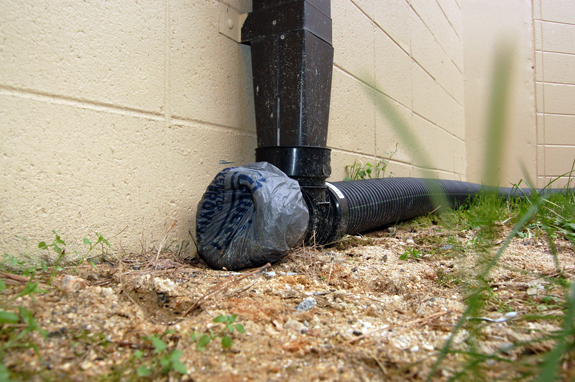 Plastic grocery bags are duck-taped to a pipe to help divert water coming from a downspout into a drain line that runs on top of the ground. LOUISBURG -- Renovations to the county's jail are six months behind schedule, water leaks back into the building and rainwater ponds on the roof, but the architect and county staff say every effort is being made to finish the project. The Franklin Times staff sat down with Sheriff Kent Winstead and Maj. Rudy Baker in February to discuss the $3.6 million project, which includes a new roof, medical isolation cells and a myriad of other upgrades to the building originally designed and built in 1996. LOUISBURG -- Against the objections of dozens of residents, county commissioners agreed to rezone a property along one of the county's main thoroughfares to make a storage facility development more viable. Steven Hayes petitioned the county to rezone 10.6 acres at the intersection of U.S. 401 and Tarboro Road from Mixed Use to Highway Business to build a Gatekeeper Storage and Rental facility on site. Will more incentives revive apartment plan? LOUISBURG -- Franklin County commissioners agreed to bolster an incentive package based on a developers revamped, expanding plan. S.L. 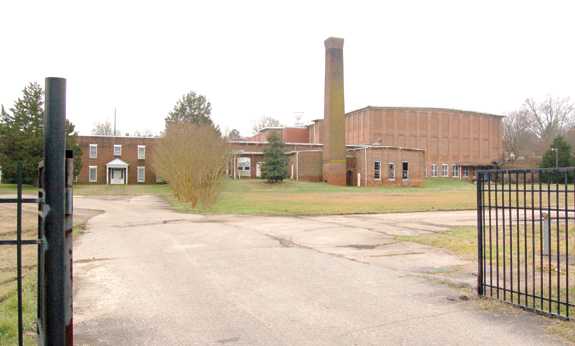 Nusbaum has proposed turning the Sterling Cotton Mill in Franklinton into a residential development, while maintaining 33,000-square feet for the current occupant -- Inter Technologies -- and space for a police department substation. Last January, Franklin County commissioners agreed to provide $58,000 in incentives for the project, essentially setting off the capacity fees for the development. Franklin Countians bid farewell recently to Atlas Cohen Smith -- far better known as Pete -- once a self-described "shade tree mechanic" who built a successful auto repair business that still carries his name. 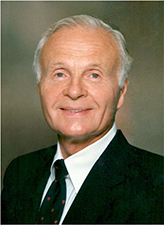 Variously described as a "swell person" who accomplished a lot, ambitious and, perhaps most of all, a hard worker who always tried to do his best, Smith, who died at 87, was well known around the community. He died Thursday, March 3, after a period of declining health. His full obituary appears elsewhere in this edition. LOUISBURG -- The Franklin County Board of Health expects to begin conducting interviews in a few weeks to find a new health director. The board fired Dr. Chris Szwagiel in January after nearly seven years on the job, citing issues with his personal conduct related to personnel issues. The board immediately began soliciting candidates for the post and when the deadline passed on Feb. 6, they had received about a dozen applications, said Board Chair Eddie White. Finally, a hit of spring has arrived -- and we can only hope that it sticks around although we're undoubtedly due for a few chilly, perhaps rainy days this month. But at least we've been seeing the sun -- and enjoying its effects. Planting season isn't far off! But for the foreseeable future, we still have this unusual March Primary Election to get through. Elephants and donkeys: Listen up, get serious! In a Presidential election year where name calling, cheap shots and boisterous behavior have been in the spotlight, one group deserves kudos for being the adult in a room that's too full of bravado to be productive. That group is the American Association of Retired Persons, better known simply as AARP. Perhaps you've caught one of their thought-provoking ads on television, stuck in among the clutter. 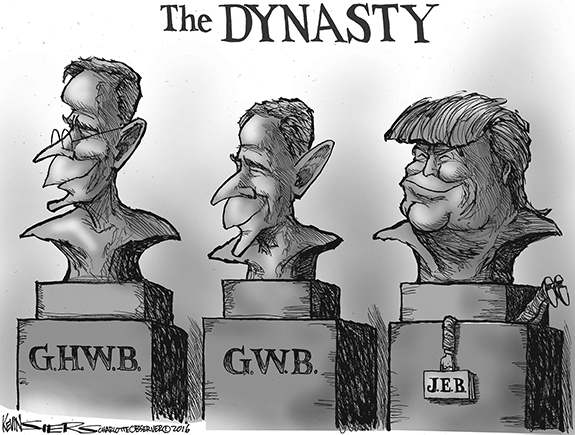 I was never that big a history fan when I was in school. In fact, the only time I really recall falling asleep in school was during History class. However, as I sat in a county planning board meeting on Tuesday night, I was piqued by a comment that had me digging into recent history in Franklin County. Let me take you back to 2010. Admitting racism is something very difficult for a political party to do. Apparently, eradicating one of its last remnants is equally difficult for the radicals in Raleigh. The practice of runoff elections in non-presidential primaries originated in South Carolina and dates back to the late 19th century. Today, this is almost exclusively a southern phenomenon. Is it time for a political 'sight alignment'? 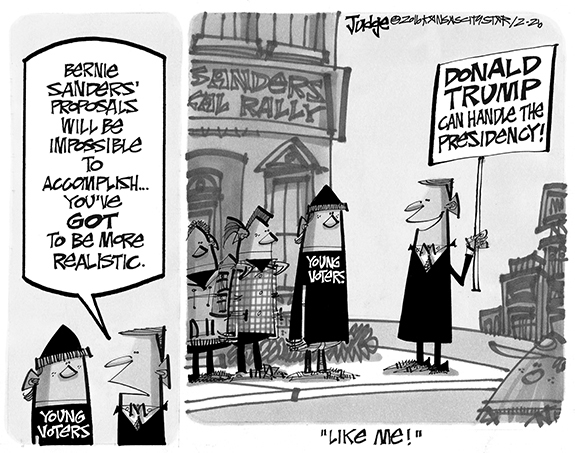 If nothing else, elections are target rich for those in the media. For every point there is a counterpoint. One person's champion is another's adversary; an endless salad bar of keyboard delight to write about. So metaphorically, just eat away, take it all in. At a salad bar, have you ever given thought to what has been placed in the bottomless trays? If I have, it has only been a passing thought as I piled on my plate. RALEIGH - Funeral services for Clara Cooke Rushing, 76, who died Sunday, March 6, 2016, will be held Friday, March 11, at 1 p.m. at Faith Missionary Baptist Church in Louisburg, with the Rev. Alexander Herring officiating. Burial will follow in the church cemetery. DUNN - Funeral services for Lisa Ann Arrington, 47, who died Monday, March 7, 2016, will be held Sunday, March 13, at 2 p.m. at Richardson Funeral Home in Louisburg, with the Rev. Kenny Dupree officiating. Burial will follow in the Cedar Rock Church cemetery. FERGUSON WITH THE FORCE. 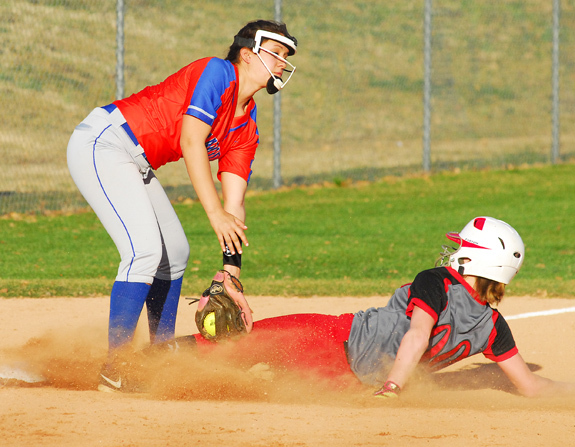 Louisburg High School freshman Taylor Ferguson (left) executes a force play at second base as part of Tuesday afternoon's home softball showdown against the Franklinton Lady Rams. LOUISBURG - Franklinton didn't take long to make a Summer Splash to kick off its 2016 fast-pitch softball season. 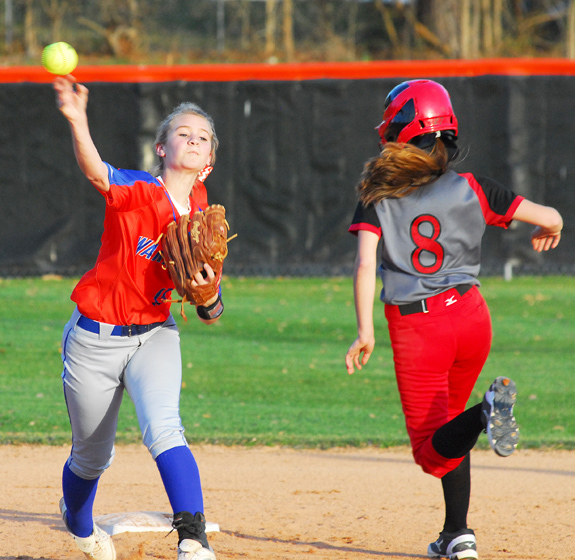 FHS junior hurler Summer Jacobs, in her third season as a hill starter, tossed a shutout and also contributed at the plate as the Lady Rams topped previously undefeated Louisburg by a 3-0 margin on Tuesday in non-conference rivalry action at the LHS Softball Field. Jacobs, effectively mixing up a fastball and change-up, kept the Lady Warriors off-balance the entire way, limiting them to just four hits while striking out nine and walking just one. BALANCING ACT. Bunn's Morgan Williamson (left) lunges for possession during last Wednesday's home soccer match versus Northern Nash. 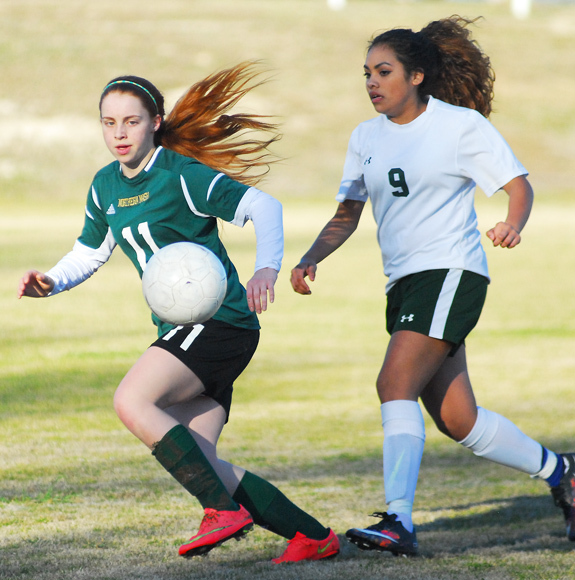 BUNN -- Had it not been for the heroics of Northern Nash's Rebekah Beal, the Bunn Ladycats might be off to an undefeated start this spring in girls soccer action. Bunn, coached by Charles Haley, tangled with Beal and the Lady Knights in a rare home-and-home showdown on back-to-back days last week. 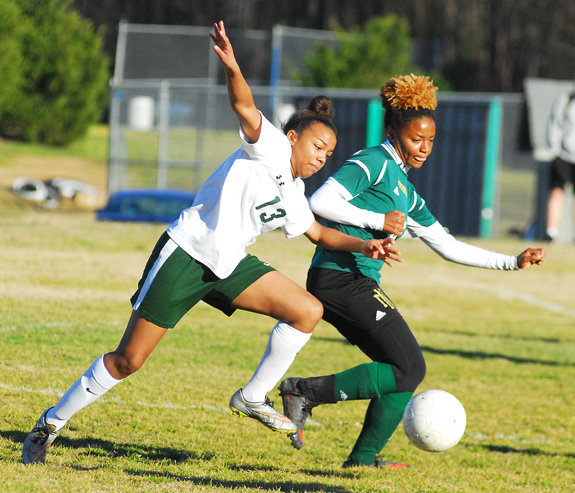 Thanks to a combined seven goals from Beal -- a Chowan University signee -- the Lady Knights were able to pick up tight victories in each contest. In last Wednesday's meeting at the BHS Soccer Field, the Ladycats led in the first half, only to see Northern Nash rally to take a one-goal cushion at half. ALL-TRAC. Louisburg High School's Summer Phillips earned a spot on the All-Tar-Roanoke Athletic Conference girls basketball team this past season. LOUISBURG -- Louisburg High School's successful boys basketball campaign was reflected by plenty of recognition on the All-Tar Roanoke Athletic Conference Team. Three Warriors claimed TRAC accolades -- guards Kenan Epps and Andreas Wilson and frontliner Tony Vines. The trio helped Louisburg finish in the second place in the TRAC regular season standings, along with a runner-up spot in the TRAC Tournament. ROCKY MOUNT -- Nash Central notched one run in the bottom of the first but couldn't dent the plate the rest of the way en route to being defeated by Bunn by a 7-1 total on Monday in high school baseball action on the NCHS campus. Bunn never trailed after delivering three runs in the top of the first thanks in part to a Jordan Payne RBI double, along with a leadoff single from Nick Sanders. The Bulldogs also committed a costly throwing error as part of the uprising. 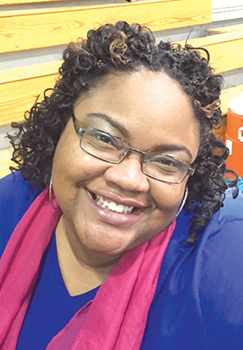 SOUTHERN PINES -- One of the most disappointing losses in recent Louisburg College men's basketball memory came last year when the Hurricanes were defeated at home by Richard Bland in the finals of the Region X Tournament. Current members of LC's sophomore class weren't about to see history repeat itself at this year's tourney. 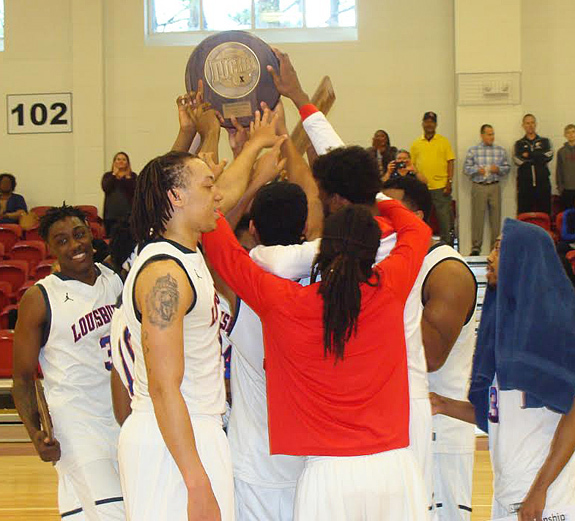 Instead, Louisburg punched its ticket for a return trip to the nationals with a decisive 78-63 triumph over Catawba Valley in the region championship last Saturday at Sandhills Community College. GREEN AND GOLD AGAIN. 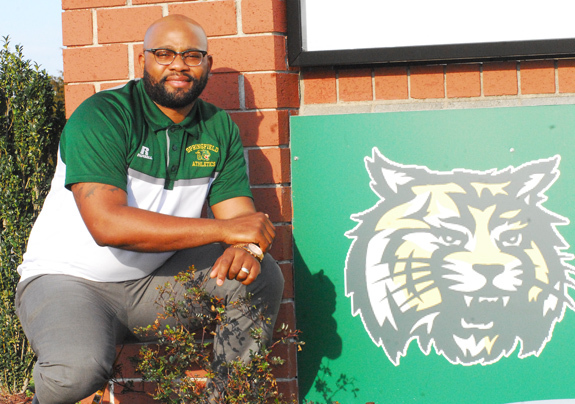 Bunn High School graduate Jairod Barnes is enjoying a successful tenure as a teacher and coach at Springfield Middle School in Wilson. WILSON -- Jairod Barnes couldn't help but ponder the symbolism when he first drove into the Springfield Middle School parking lot. The buildings were adorned with green and gold -- the school's official colors. And a snarling Wildcat is emblazoned on the front entrance sign. For Barnes, it felt a bit like home -- and for good reason. CHAPEL HILL -- The North Carolina High School Athletic Association has announced the game times and sites for the eight championships in the NCHSAA's 102nd State Basketball Championships. The Dean E. Smith Center in Chapel Hill will host the 2A and 4A games, while Carmichael Arena across campus will host the 1A and 3A games. LOUISBURG -- It's still early in the season, but Louisburg High School's baseball squad has already come up with a victory to remember. The Warriors, trailing by five runs, rallied in the bottom of the fifth and sixth innings to edge Warren County by a 6-5 margin on Monday in a non-conference diamond meeting at Warrior Field on the LHS campus. Louisburg is now 2-0 overall. The Warriors opened last week with a victory against Franklin Academy. (L to R) Northern Nash's Olivia Bunn and Bunn's Maria Ocampo try to track down a loose ball during last Wednesday's soccer showdown at BHS. 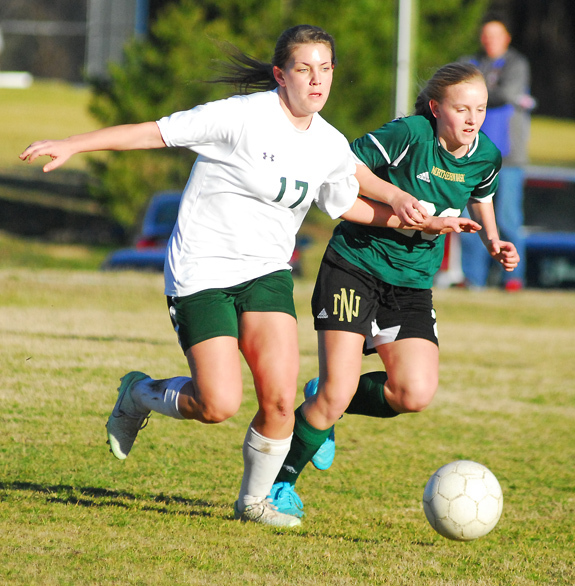 Bunn's Haley Jones (left) advances the ball last Wednesday against Northern Nash. 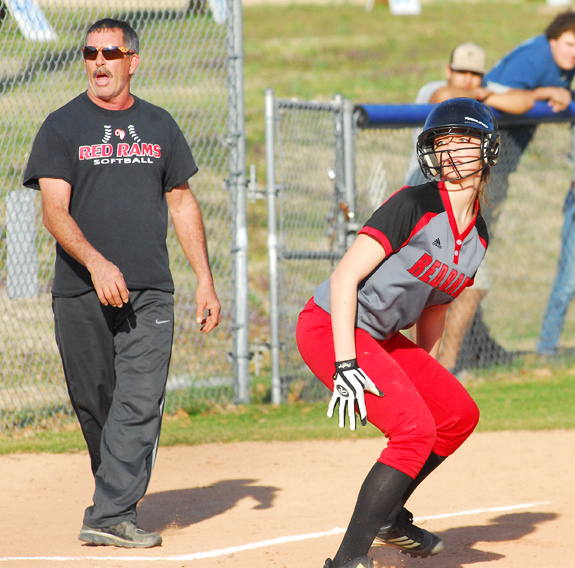 Franklinton HS pinch-runner Rachell McDonald (right) slides down the third-base line as coach Felton Jacobs shouts instructions during Tuesday's game at Louisburg. Louisburg High School third baseman Melayna DeJesus (left) makes a tag to thwart a stolen-base attempt on Tuesday against Franklinton. Although several private academies flourished in Franklin County during the early 19th century, local officials did not establish public schools until 1841. The fledgling school system resulted from state legislation and received support from a fund that had been conceived in the 1820s by a Franklin County educator and legislator. Known during the early 19th century as the "Rip Van Winkle State," North Carolina suffered because conservative lawmakers were reluctant to appropriate funds for public education and for transportation improvements. LOUISBURG -- The son of an area sheriff avoided jail time this week after having a DWI and speeding case disposed. Youngsville police arrested Patrick S. Williams during the early morning hours of July 4 after he passed by officers at a high rate of speed on U.S. 1, according to the police report. According to the report, Officer J. Garrett initially gave pursuit, activating his lights and siren at the intersection of U.S. 1 North and Bert Winston Road. 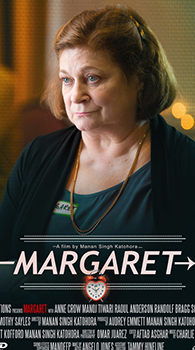 Once again, Franklin County North Carolina International Film Festival (FCIFF) opens its doors and returns to host screenings and discussions of a wide array of independent international films from around the world with a two-day festival. FCIFF aims to bring high-caliber, international independent cinema to a county renowned for its love of culture and the arts. Pamela Andrejev, events coordinator for Franklin County Arts Council, said, "the FCAC is excited to host the 'kick-off' for this year's FC International Film Festival. BIG WINNER. 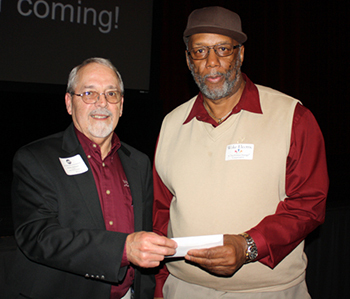 Youngsville resident James Blacknall (at right), was the lucky winner of the $1,000 grand prize drawing and receives his check from Reuben Matthews, board president. Wake Electric held its 2016 annual meeting on Friday, March 4. More than 600 co-op members came together at the Louisburg College Auditorium to hear business updates and a presentation from Jim Mangum, CEO and general manager. Three board members were re-elected to serve three-year terms on the Wake Electric Board of Directors, including: Allen Nelson, District 1, Stovall; Joe Hilburn, District 4, Raleigh; Joe Eddins, District 8, Zebulon. BUNN -- Commissioners hired a consultant group to aid with the planning and design of the town. The board agreed to hire N•FOCUS, a Kannapolis-based group that aids smaller towns with land planning, ordinance development and other planning and zoning issues. The town's previous planning and zoning director had taken ill, allowing some matters to be unattended. LOUISBURG -- Louisburg police officers arrested one man and are looking for another involved in a shootout. According to police, they were called out to the sheriff's office parking lot the evening of March 4 to meet with Sylvester Cooke, whose car was damaged by gunfire. According to the report, Maleak Yancey was driving a vehicle and another man, Tyrece Mitchell, was driving Cooke's car when they exchanged gunfire in the 500 block of Kenmore Avenue, police said.